Prepare for the adorableness, people. The Sand Cat (Felis margarita) is a small felid that can be found in northern Africa and southwest/central Asia. It is the only wildcat that has adapted to live primarily in true desert environments. In fact, in captivity they have been known to develop respiratory infections and disease if they are not kept in enclosures in which humidity and temperature are tightly controlled. They are considered Near Threatened by the IUCN, because of its declining population. The Sand Cat's distinctive black bars on its forelegs are one of the things that make it so recognizable, along with their sand-colored coats, large ears, and kittenish faces. They grow up to 20 inches (52 cm) in body length, with 12-inch (31 cm) tail. At most, they weigh about 7 pounds (3 Kg). Like the Fennec Fox, the fur on the bottom of their feet grows long to create a pad of fur as protection against the hot desert sand. Also like the Fennec Fox, their large ears help to regulate body temperature and give it very sensitive hearing, which helps them to locate prey. Sand Cats are quick, able to reach speeds of 25 miles per hour (40 km/h). Radio telemetry studies have revealed that Sand Cats are can travel 6.2 miles (10 km) in a single night, and are very active during the night. The times during which they are active depend on the season. During the winter they will venture out during daylight to enjoy the sun, but during the summer they are active only during twilight and night-time, spending the hot days in their burrows. Sand Cats usually have several burrows in their territory. They don't change burrows during the day, but will travel from one to another at night. Sand Cats feed mostly on small rodents like gerbils, mice, jirds, jerboa, and young hares. They will also eat birds and reptiles. Sometimes they will bury leftovers in the sand, making a cache for later. Most of their water intake comes from the food they eat, but if they come across water they will drink. Female Sand Cats will give birth to a litter of one to three kittens after a 66-day gestation period. The kittens grow rapidly, reaching almost their adult size within five months. 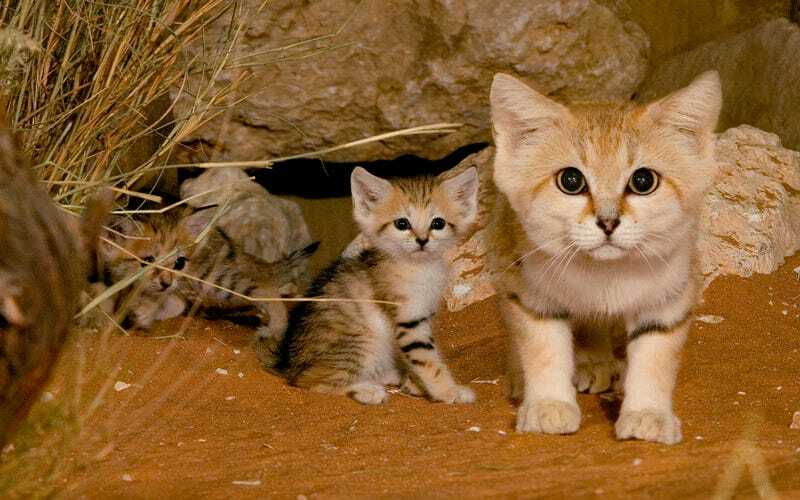 Sand Cats are most threatened by habitat degradation, which includes ecosystems being destroyed by human settlements and activities, like cattle grazing. Their entire food source depends on having adequate vegetation, which can be scarce enough already in the desert.